Ramsay Garden is a block of sixteen private apartment buildings in the Castlehill area of Edinburgh. They stand out for their red ashlar and white harled exteriors, and for their prominent position, most visible from Princes Street. Now there is nothing particularity special regarding these flats but, look at the roofs, on one there is a wee statue of a cat, looking down. Why is the cat there? I have no idea. 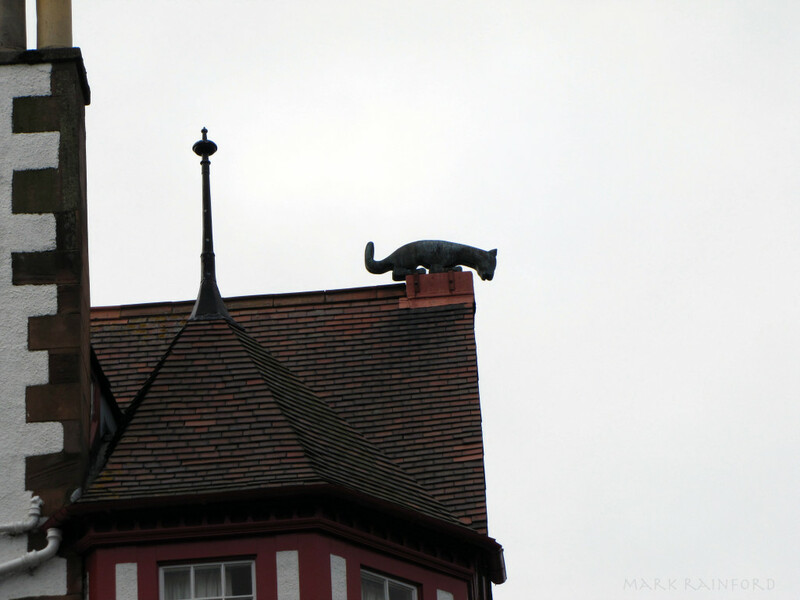 Large sculpture that was designed as a devil, but now looks like a cat with up-curled tail, stands on gable of Ramsay Garden peering down into Princes Street Gardens. This was originally one of three sculptures on the roof of Ramsay Garden. An angel finial stood above the western gable of the Princes Street façade, and a sphinx in the centre further back. Geddes may have been influenced by seeing ceramic creatures decorating roofs in India. Hmmmmm, I cant see that as a devil?